Some tragic news out of New York, where a man fatally stabbed his wife and teenage son before setting their Flushing apartment on fire and slashing his own throat in a grisly murder-suicide. 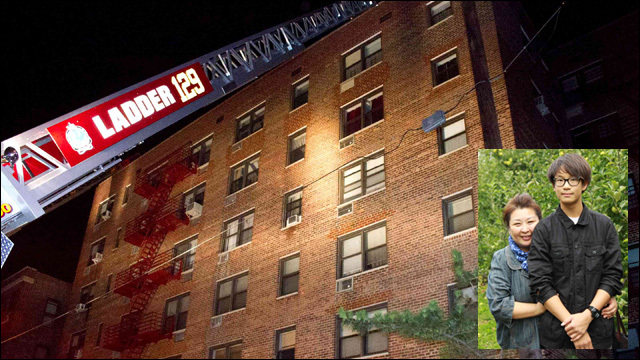 Firefighters discovered the bodies of Lee Joon, his wife Lee Sung and their 15-year-old son Brian Lee in the living room of their sixth-floor apartment early Tuesday morning. Mr. Lee was found with a suicide note in his pocket, hand-written in Korean, complaining of "too many problems." Those who knew Mr. Lee, who worked as a tractor-trailer driver, were aware that his family had been dealing with serious financial setbacks. In a short note written in Korean to a relative, Jong Lee complained of having “too many problems” in his life. The note did not elaborate on the nature of his problems, but those who knew the Queens man were aware of serious financial setbacks for his family, according to a police official who viewed a New York Police Department translation of the document. Detectives found the note singed by fire and stained in his pocket on Tuesday after, the police said, Mr. Lee, 50, stabbed and killed his wife and son and set their apartment on fire before taking his own life. Firefighters discovered his body and the bodies of his wife, Sung Lee, 54, and their son, Brian Lee, 15, when they responded to the blaze. According to an official from Flushing City Council Member Peter Koo's office, Mr. Lee was injured in a 2011 car crash and was concerned that his deteriorating health could cause him to die before his wife and son, leaving them to deal with debt. If you or someone you know are having thoughts of suicide, there is help. In the U.S., please call the National Suicide Prevention Lifeline at 1-800-273-8255, anytime 24/7.